Design Problem solving is an important part of CEED exam and it combines application of your creativity with sketching. So, we will see one more example - by way of solution or answer to CEED 2014 Product design part for now. Present road side waste containers are normally dirty, stinking and spilling over. Design roadside waste container bin(s) to be used in public places for segregation of the following categories of waste. All other kinds of leftover. The container(s) should be rugged, movable so that the waste can be transported for periodic disposal. With a neat freehand sketch showing the form. Indicate the materials and processes used in manufacturing. Support your design with a brief note on the design decisions taken. Appropriateness of materials to be used in the manufacturing of the final product. Let me discuss a little about the importance of 'evolution criteria' before proceeding to the actual design. The examiner puts his focus completely on the evolution part and he checks whether your designed product meets the requirement or not, and if it met, then to what extent !. So, you should care for that and give much concern to the question, the requirements and the evolution criteria. To confirm this, I did some experiments while writing CEED exam last year (2014). For the first question of CEED 2014 design part - that is to make a freehand sketch of a person opening a door, I knowingly skipped two evolution requirements, and due to which I received very less marks, even though I spent much time to make that sketch look good. I also spared part of the time (that I was supposed to use for the 50 marks design question) to make this sketch look great and I can say, it was one of my best try ever. But even then, I only got very less marks for that attempt ! Now I did the second experiment - for the 50 marks design question (I preferred product design question as I'm good at product design) I made simple rough sketch, but I took care to meet almost all the requirements of the question minding the evolution process. But unfortunately, since I already wasted some time attempting first sketch question, I couldn't make the rough sketch better, it went below rough ! But alas, I got unexpected marks - suitable enough to clear and get good score ! I therefore confirmed - those ideas that have been communicated with all the need of the question succeed greatly than any other attempt to make that - visually better; but no much concern on the requirements. So, please be careful and understand the question as well as the evolution process. Let's now solve the design question giving care to the evolution process as well. Most of the time, dustbin with wet and organic wastes requires periodic cleaning, pesticide control and other hygienic control steps to avoid unhygienic conditions. So, they need to be processed for some part of time. While dry and solid waste dustbins can be serviced after even a month. So, the dustbin should accommodate replaceable individual parts, without making the need for moving the entire dustbin thus eliminating the waste of men, machine and money ! The dustbin should be movable, in other sense portable to make it usable wherever required in roadside. Since it is required to make the dustbin portable, it should therefore be simple, light weight and probably be handled with ease with minimum number of accessories. The dustbin should not be easily accessible by animals, insects and any other foreign disturbances. It should be unique to make it attractive and user-friendly. The bottom circular trolley was proposed to be made with Mild Steel (MS) material coated with corrosive paints so as to make it strong, load-bearable and of course corrosive to environment. These dustbins were designed so that individual parts can be mounted or dismantled with ease. The dustbins were designed with less ground or width requirement so as to occupy less space but accommodate more waste. These dustbins were designed to eliminate much of the maintenance cost as well as physical requirement - by the provision of individual replaceable bin. Attractiveness and uniqueness will make the users feel the need for dustbin usage and hence they might not throw the wastes here and there - thus directly eliminating additional efforts and costs. Below are shown my illustrations for the dustbin question. I used Adobe ideas software (iPad app) to do the above illustrations - just for my own convenience and practice. But this is not allowed in your exam and you need to really do this with pencil and importantly with freehand. I also didn't show rough sketches here, while I recommend you to do so. As we had gone through the Multi-purpose design aspects, I would like to share my ideas and thoughts (you may call it tips) that you might find useful while attempting similar design problems. First things first, The better way to deal with this type of problem is to try rough sketching first (instead of doing the perception and solution writing). Because when you start sketching, in the process you might get a better idea than what you had thought earlier. Suppose that you wrote the explanation and solution part first, then you might face difficulty in adding or changing the wordings. So better start with rough sketch, second comes writing part and then go for final sketch. Using pencil for sketching rather than colors will help to make easy changes. I will utilize the first page (given for final answer) to write the problem perception and solution part. Second page will be used for the overall drawing with construction and the third page for detailed part sketches. Note that rough sketches could be impressing the examiners and in there you can show the construction part in exploded view format. Exploded view are nothing but showing all the assembled parts individually. Just imagine and draw how the product looks if all the parts were removed like say removing bolts, connections etc. No need to go for detailed sketch, just a basic and simple rough sketch do a great job. I avoided showing exploded view and rough sketches for this question (in this page and not in exam) because of less time. You should be showing that in simple way. Exploded Sketching and rendering for this type of questions won't take much time (as there are no background themes or portraits to be drawn). So, utilize the time and try to give detailed drawings, especially the individual part sketches, like I did in my illustration for the design question - multi purpose walking stick design. If you find time, you may try coloring also only if specified in the question. You may reduce the number of 'identified problems', but let the problems be acceptable. Thank You Sir..! You are doing a great job...! I would like to say first Thank You Sir..! I applied for the CEED Exam but hopeless. 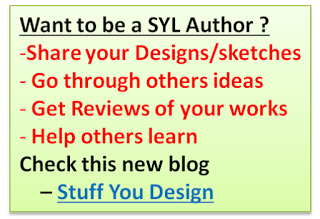 Because of your blog I learned so many things like sketching ability, design ability, Problem identifying & solving and presentation in exam. Now I feel very helpful. Thank You Very Much Sir...! can u please give me a hint or SOLUTION for the question no.2(creativity and imagination) of ceed 2014 paper?i am unable to understand the picture.so please narrate the incident in ur own words to give us an idea. hello sir thank you for the supporting and giving such a great idea tips as a student of b.f.a applied i was not known about all this but with the help of your it could be easy to understand the exam paper and much. please tell me how much rank need for joining in IIT, and Mark too,in ceed 2016 exam. Can you put some Design practice exercises other than the one mentioned on the site. Firstly,thanks a ton for the amazing blog :) A big fan! I wanted to ask as to how to proceed in the questions involving creating interesting products from given set of cubes,spheres,cylinders,cones,discs etc. asked every year??? 1.Can we assume them hollow? Repetition of objects is not allowed unless they specify, and assuming hollow shapes also not allowed I guess.Only alteration u can expect is the capability of the solid to allow for the thread/wire pass through it. I mean a small hole that allow the wire to be passed through it. 1 Cone, 1 Hemisphere, 1 Cuboid, 1 Cylinder and 1 Disc as shown below:Imagine 3 interesting products made out of a combination of minimum 3 objects. You can scale the objects to any size and dimension. Represent your ideas with neat sketches and name them in the space provided. Actually i had tried creating 1.salt and pepper dispenser,2.soap tray,3.bird feeder,but then as you said i cant assume them hollow.So i am in a fix. Let me put this way, assume you're asked to sit in a isolated room and are given these objects, then what creative object would you be able to do with them? You can think and answer on this. However, I do feel that you can use some additions like threads, wire, etc. but not repeating or reusing the same part or using them in cut form. sir , how can we prepare for the part B sec? and score good ? I think you must have started recently! You have 5 days left! Are we allowed to use scale,rounder or any other instrument in part B CEED exam? Ya, u can take scales, but don't use that much, try to draw lines free hand, some ques specifically mention that using rulers are not allowed, be cautious for those ques and avoid using instruments for them. Sir, This site is very helpful but most of the images posted on this site does not open. Please fix the problem or give a solution. Everything is fine and the images open for others too, probably u need to check ur internet connection or try opening the page in different browser. Sir, Is it necessary to include the form or the ideation through which i will get the final design of my dustbin? I always sketch final design and I avoid showing how did i get that form! Can you tell me what shall i do? It’s better to show how you got for this specific kind of questions esp when they mention specifically to show 2-3 ideas and then your final design. For such ques, u have to show how you got the idea or express ur final design as a conglomorative of several other ideas. For product design ques mentioning like ‘show the exploded views’ etc you may consider giving much emphasis to the final design which includes your exploded view. In any case, jus follow the requirements as in ques. Mr. Bhanu ......i have a question to you.....can i know wheather dat paper is same for all specializations?.......else if how would the dat paper for m.design in transporation design look like......if you are having any solved paper of transportation design m.design course, can you please share it? The second dat exam (or so called studio test) are stream specific and ques would be asked specific to that stream. There is no common pattern followed for the individual insti conduct the exam their own pattern. Regardless, you will have to face the questions similar to ceed exam. Both subjective and objective ques can be expected. I think more weightage would be given to the subjective (sketch,!desifn, hand on etc) and the objective might cover syllabus similar to ceed part A. Whatever I’ve had already been shared in this blog. If pd questions doesn't ask for exlpoded veiw.so Can you tell me what shall i do? it depends on the product. See, exploded view is recommended desired when your product has several embedded parts that go inside another component of the product and when that is needed for explaining the product functionality. Else, just show the whole product along with important parts that needs special attention and also rough sketches of alternative concepts if applicable.